Purple shore crabs in both purple and olive shades. Photos by Sara Wickham (left), Heather Polowyk (top right), and Julie Mundy (bottom right). 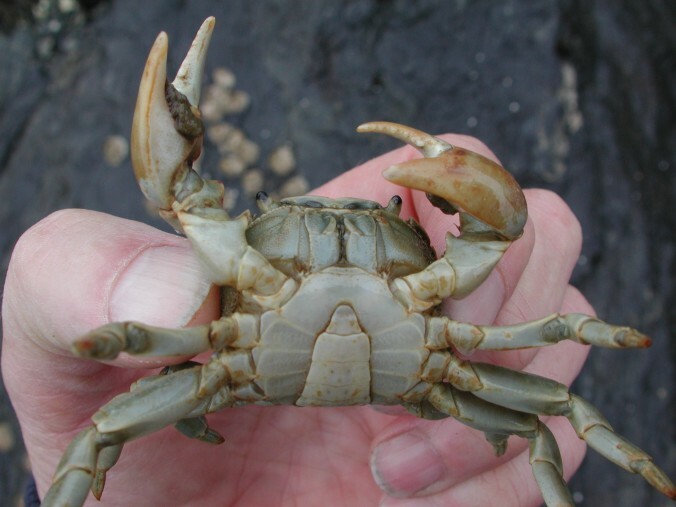 This small crab measures up to 5.5 cm across. 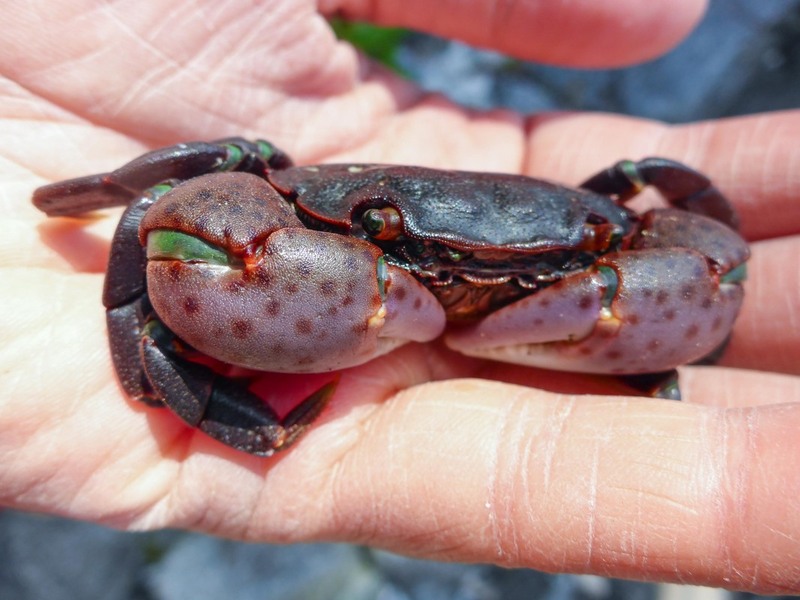 It has a square carapace (shell) that is usually dark purple as per the crab's name, but can range in colour from olive-spotted, or dark olive to red-brown. It usually has purple spots on its pincers, though this is not always the case with a green variant of the species. One key identifying feature is the lack of hair on the crab's legs. This species is commonly found under rocks in the intertidal. It is found along the Pacific coast of North America from Alaska to Mexico, however it is less common south of central California. 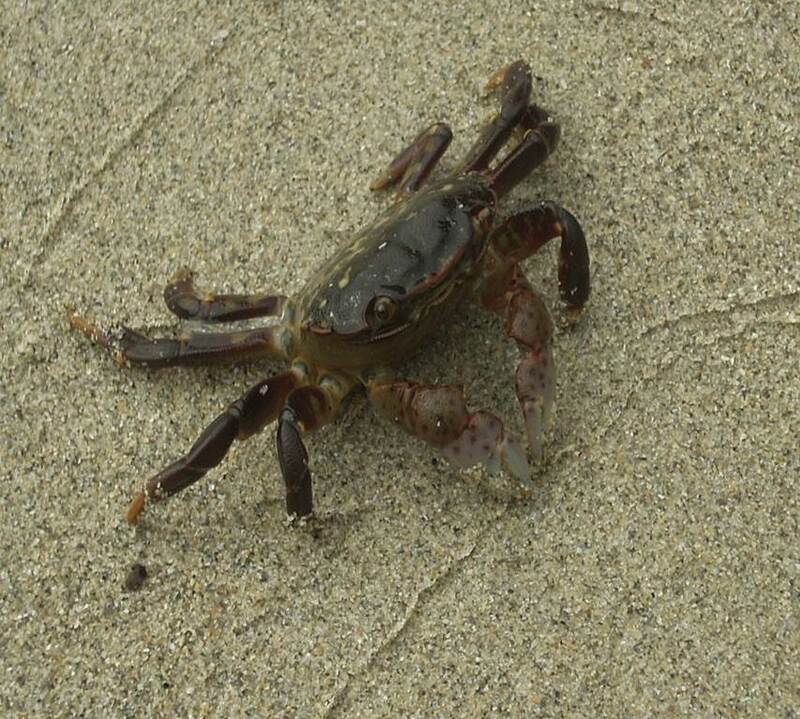 The hairy or yellow shore crab (Hemigrapsus oregonensis) is similar in size to the purple shore crab and found in the same habitat. However, as the name suggests, the hairy shore crab has hairs on its legs, whereas the purple shore crab does not. 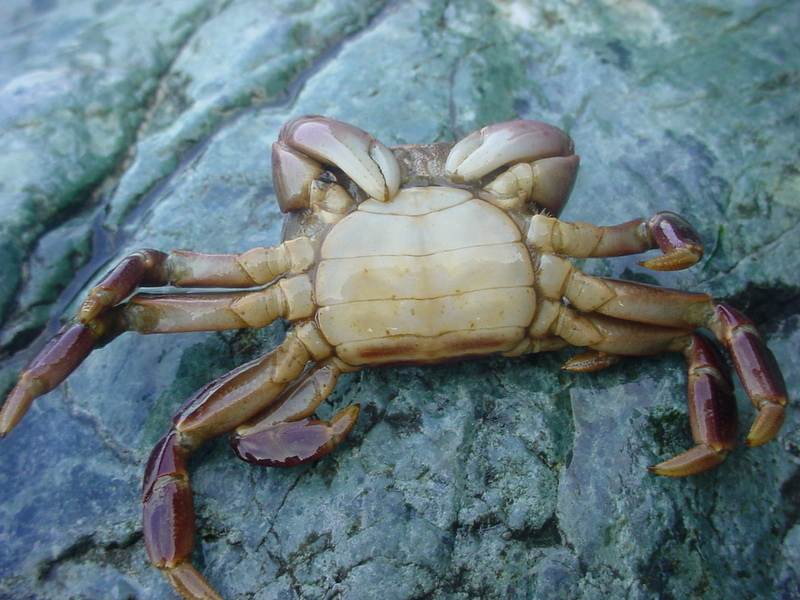 Generally the hairy shore crab is also lighter in colour — though it may be darker green like the purple shore crab — and it has white or light yellow claw tips. 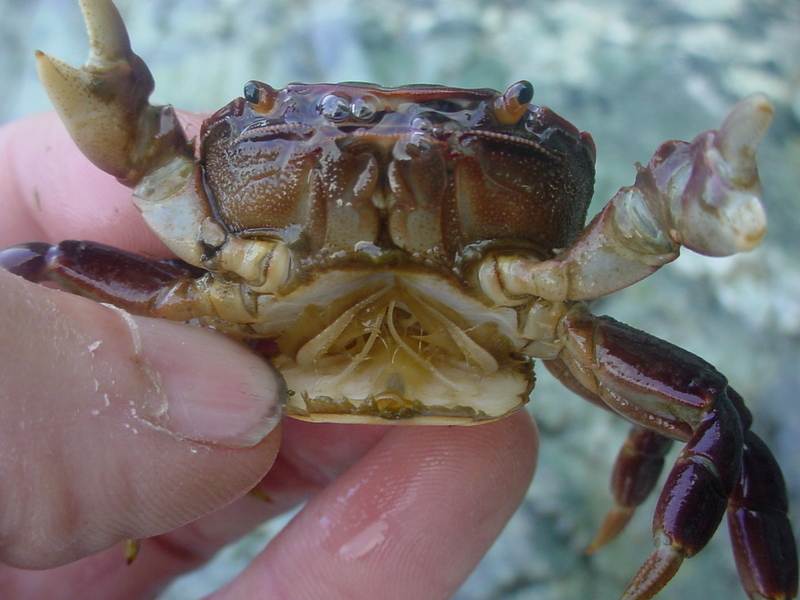 Purple shore crabs, like many other crabs, can be identified as male or female by their abdomen structure. Males have an 'Eiffel tower' shape, while females have more of a 'beehive'. The female's rounded abdominal flap can carry up to 36,000 eggs. Egg-carrying females may be seen from January to mid-July. Cowles, D. (2005). Hemigrapsus nudus (Dana, 1851). Invertebrates of the Salish Sea. Rosario Beach Marine Laboratory. Accessed 20/04/2013. Harbo, R. M. (1999). 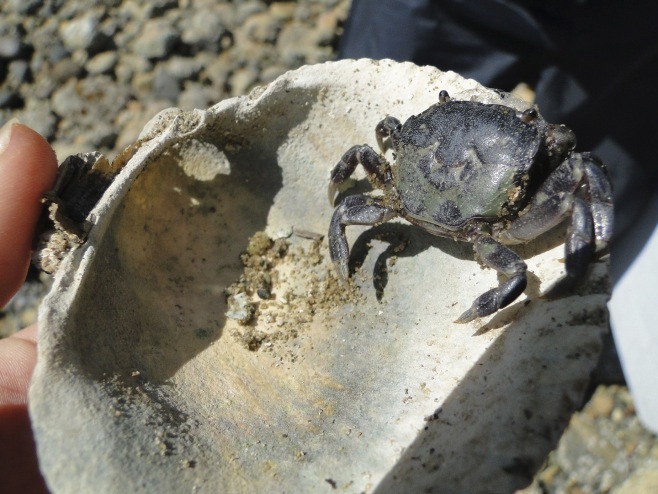 Whelks to whales: Coastal marine life of the Pacific Northweest. Madeira Park, BC: Harbour Publishing. P. 75.